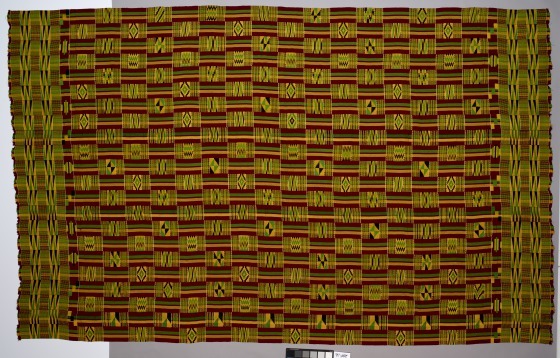 Kente is the best known and most popular of the Asante textiles. Oral traditions credit a spider’s web-making with having inspired two hunters to create the first kente. Osei Tutu I, the first king of the Asante, reserved the cloth for royals. 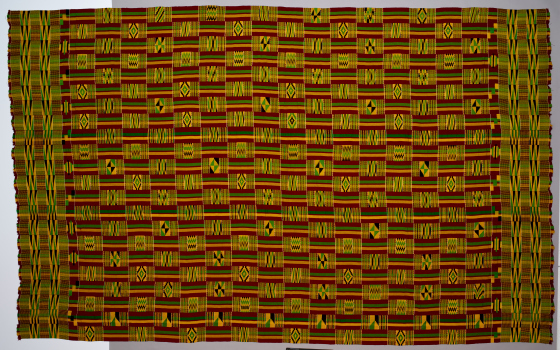 Over time, with greater varieties of colors and materials, kente became accessible to more of the population. Silk kente with named designs continue to be limited to Asante elites. These cloths (called wrappers because of the way they are worn) are fashionable for both men and women. 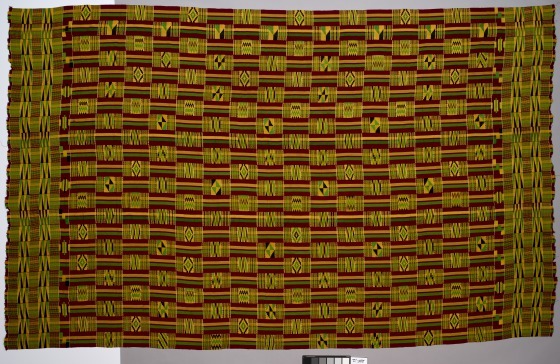 For men, a kente wrapper circles the body and may drape over a shoulder like a toga. Women’s kente include two-piece garments or modern, peplum-style long dresses. The Oyokoman pattern is a warp-stripe composed of wide gold and green stripes embedded in a dark red field. 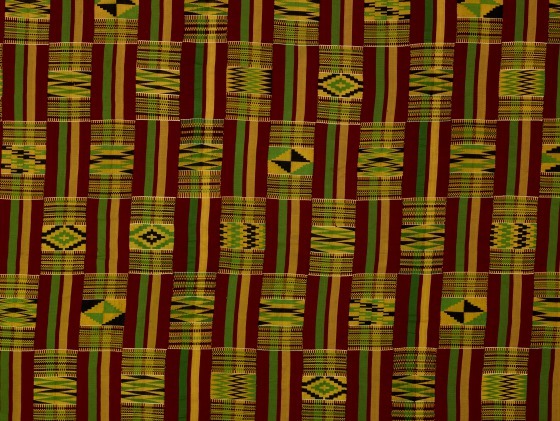 It takes its name from the Oyoko royal clan and is believed to be among the first and most elite of all kente patterns. Oyokoman is the most frequent warp pattern for Adweneasa, a weft design that would overlay the pattern shown here. Roslyn Walker, The Power of Gold: Asante Royal Regalia from Ghana, Label text, 2018.